Not Once, but Hit ‘N Strum. It’s not hard to see why Hit ‘N Strum was the runner-up for the Audience Award at last year’s Whistler Film Festival, with the musical drama hitting a lot of hometown notes. But besides the local appeal and a heartfelt soundtrack, there is little about Kirk Caouette‘s debut that audiences haven’t seen before. And that’s assuming that the songs that dominate the otherwise paint-by-numbers story aren’t themselves a little familiar and/or appeal to your musical taste. There are a few non-musical moments that manage to make a mark but not enough to suggest that the film is anything except an excuse to showcase the writer-director-star’s accompanying album… which is obviously available to purchase and pretty much the first thing that pops on the screen when the credits roll. Sorry, I’m getting ahead of myself. 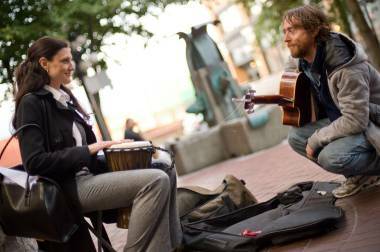 Hit ‘N Strum, the first film from veteran Vancouver stuntman Caouette, follows the unlikely friendship between his homeless busker, named Mike, and Stephanie, a beautiful business woman played by Michelle Harrison. I did like how Hit ‘N Strum didn’t waste any time in the beginning, and immediately throws us into the action with the pair’s meet-cute as the too-busy-with-work Stephanie hits our homeless protagonist with her car before strumming, sorry, running away from the scene. The set-up is simple and effective. Sadly the remaining 80 minutes play out exactly how you’d expect them to, minus a few noteworthy (and unmentionable, so as to not spoil) exceptions that I separate this indie effort from more mainstream counterparts. However, the film, set in Vancouver’s set in Downtown Eastside (mostly in Gastown, conspicuously avoiding the real problem area of East Hastings) lacks the originality, authenticity and, well, Oscar-caliber songs that made, say, Once so special, memorable and, most importantly, relatable to audiences everywhere. Like the “invisible” people Hit ‘N Strum strives to depict, the film will likely have little impact on those who aren’t tied to the area or swayed by Caouette’s (repetitive) soundtrack. Most of the scenes that don’t depict the developing friendship or show the lead singing are nothing more than filler. The sequences that show Stephanie slaving away at work or struggling in her (completely undeveloped) relationship don’t play at all and there are only so many similar-sounding and -shot musical numbers I can take in 90 minutes. Okay. This is starting to feel like a pile-on and, for a first effort especially, Hit ‘N Strum has some elements worth praising. Although Caouette’s script or direction are not particularly inspired, he does give a pretty great performance as the stubborn and self-destructive street musician and, even though I’ve been down on the repetitive nature of the soundtrack, he is a talented singer-songwriter. It’s not my sound but he’s got a unique voice and decent lyrics. When it comes to his counterpart, I don’t particularly buy Harrison’s scenes away from Mike (which might stem from the script more than her talent). However, she occasionally does break through the mediocrity so perhaps with better material, the actress might deliver a more consistent performance. Finally, director of photography Pieter Stathis captures some lovely shots of the landscape as well as intimate looks at street-level, even though the project was clearly under financial restraints that forced them to use a more commercial-grade digital camera. Still, despite the simple beauty, I wish Hit ‘N Strum had tried harder to distinguish itself aesthetically from every other indie coming out on digital these days. And, ultimately, I think that’s the biggest problem facing the film – the fact that there are so many movies being made these days that playing it safe with a seen-it-before story to showcase a few original songs just isn’t enough unless the soundtrack itself is unforgettable. Since I can’t distinguish one track from the other, or recall a single title, I can safely say it is not. I take it back. It is hard for me to see why Hit ‘N Strum almost walked away with the Audience Award from the Whistler Film Festival. Maybe it’s because I have no ear for new talent, or worse no heart. Maybe the film’s charms are lost on me because I am not originally from Vancouver. But that in itself should highlight the shortcomings, shouldn’t it? Not blinded by local love, I’m able to see through the parts that tug on those Western Canadian heartstrings and notice that, at best, Hit ‘N Strum is hit and miss.